The aim of this study is to understand the illness experience and describe the common themes in the group process with a qualitative research method. Four women with an eating disorder diagnosis from the Eating Disorders Unit in Istanbul University, Psychiatry Department attended eight sessions group psychotherapy. Group process was examined with a phenomenological research design. According to the results, two major themes were found; illness experience and group process. Illness experience includes food, body image, impact of disorder, cognitive factors, emotional factors, prognosis, preoccupation, denial of femininity, weight and thinness, attitudes towards illness, exercise and self-othering. Group process includes; here and now, universality, relationship with therapist, anxiety toward group, instillation of hope, group cohesiveness and group efficacy. Major themes about illness experience and group process are consistent with the eating disorders literature. It is assumed that research findings could contribute clinical practices in the field of eating disorders in terms of understanding the disease and the development of effective treatments. Bu çalışmada yeme bozukluğu vakalarında hastalık yaşantısını anlamak ve grup sürecinde yaşanan ortak deneyimleri nitel yöntemle incelemek amaçlanmıştır. İstanbul Üniversitesi İstanbul Tıp Fakültesi Psikiyatri Anabilim Dalı Yeme Bozukluğu Birimi’ne başvurarak yeme bozukluğu tanısı almış dört kadın vakayla yapılan sekiz seanslık grup psikoterapi süreci fenomenolojik araştırma deseni kullanılarak incelenmiştir. Verilerin analizi sonucunda yeme bozukluğu vakalarının paylaştıkları ortak deneyimler; hastalık yaşantısı ve grup süreci olmak üzere iki ana tema altında toplanmıştır. Hastalık yaşantısı; yemek, beden imgesi, hastalığın hayata etkisi, bilişsel faktörler, duygusal faktörler, hastalık seyri, hastalıkla ilgili zihni meşguliyet, kadınlığın inkarı, kilo ve zayıflık, hastalığa yönelik atıflar, egzersiz ve kendini ötekileştirme alt temalarından oluşmaktadır. Grup süreci ise; şimdi ve burada, evrensellik, terapistle ilişki, gruba yönelik kaygılar, umut aşılama, gruba bağlılık ve grubun etkisi alt temalarını kapsamaktadır. Çalışmamızdaki vakaların hastalık yaşantısı ve grup süreciyle ilgili yaşantılarında ortaya çıkan temaların yeme bozukluğu literatürüyle tutarlı olduğu görülmektedir. Araştırma bulgularının yeme bozukluğu alanında hem hastalığın anlaşılması hem de etkili tedavilerin geliştirilmesi açısından klinik uygulamalara katkı sağlayacağı düşünülmektedir. Amerikan Psikiyatri Birliği. (2013). Mental bozuklukların tanısal ve sayımsal el kitabı. Beşinci Baskı (DSM-5). Tanı ölçütleri başvuru el kitabı’ndan, (E. Köroğlu, çev.) Ankara: Hekimler Yayın Birliği. Amerikan Psikiyatri Birliği. (1995). Mental bozuklukların tanısal ve sayımsal el kitabı. Dördüncü Baskı (DSM-IV)( E. Köroğlu, çev.) Ankara: Hekimler Yayın Birliği. Anestis, M.D., Selby, E.A., Fink, E.L., Joiner, T.E. (2007). The multifaceted role of distress tolerance in dysregulated eating behaviors. International Journal of Eating Disorders, 40(8), 718-726. Bakalar, J.L., Shank, L.M., Vannucci, A., Radin, R.M., Tanofsky-Kraff, M. (2015). Recent advances in developmental and risk factor research on eating disorders. Current Psychiatry Reports, 17(6), 42-50. Bardone-Cone, A.M., Wonderlich, S.A., Frost, R.O., Bulik, C.M., Mitchell, J.E., Uppala, S et all. (2007). Perfectionism and eating disorders: Current status and future directions. Clinical Psychology Review, 27(3), 384-405. Bell, L. (2003). What can we learn from consumer studies and qualitative research in the treatment of eating disorders? Eating and Weight Disorders-Studies on Anorexia, Bulimia and Obesity, 8(3), 181-187. Boyd, C.O. (2001). Philosophical foundations of qualitative research. In P.L. Munhall (Ed. ), Nursing research: A qualitative perspective, Sudbury, MA: Jones & Bartlett, p. 65-89. Bruch, H. (1962). Perceptual and conceptual disturbances in anorexia nervosa. Psychosomatic Medicine, 24(2), 187-194. Button, E.J., & Warren, R.L. (2001). Living with anorexia nervosa: The experience of a cohort of sufferers from anorexia nervosa 7.5 years after initial presentation to a specialized eating disorders service. European Eating Disorders Review: The Professional Journal of the Eating Disorders Association, 9(2), 74-96. Creswell, J.W. (2013). Qualitative inquiry & research design: Choosing among five approaches. Los Angeles: SAGE. De la Rie, S.M., Noordenbos, G., & Van Furth, E.F. (2005). Quality of life and eating disorders. Quality of Life Research, 14(6), 1511-1521. Ergüney-Okumuş, F.E., Deveci, E. (baskıda). Yeme bozukluklarında grup psikoterapileri: Bir gözden geçirme. Psikiyatride Güncel Yaklaşımlar. Fairburn, C.G. (2008). Cognitive behavior therapy and eating disorders. Guilford Press, New York. Fairburn, C.G., & Harrison, P.J. (2003). Eating disorders. The Lancet, 361(9355), 407-416. Fairburn, C.G., & Cooper, P. J. (1989). Eating disorders. In K. Hawton, P.M. Salkovskis, J. Kirk, & D.M. Clarke (Eds. ), Cognitive behaviour therapy for psychiatric problems: A practical guide (pp. 277-314). Oxford: Oxford University Press. Fairburn, C.G., Cooper, Z., & Shafran, R. (2003). Cognitive behaviour therapy for eating disorders: A “transdiagnostic” theory and treatment. Behaviour Research and Therapy, 41(5), 509-528. Fairburn, C. G., Bailey-Straebler, S., Basden, S., Doll, H. A., Jones, R., Murphy, R., ... & Cooper, Z. (2015). A transdiagnostic comparison of enhanced cognitive behaviour therapy (CBT-E) and interpersonal psychotherapy in the treatment of eating disorders. Behaviour Research and Therapy, 70, 64-71. Federici, A., & Kaplan, A.S. (2008). The patient's account of relapse and recovery in anorexia nervosa: A qualitative study. European Eating Disorders Review: The Professional Journal of the Eating Disorders Association, 16(1), 1-10. Fox, J.R., & Diab, P. (2015). An exploration of the perceptions and experiences of living with chronic anorexia nervosa while an inpatient on an Eating Disorders Unit: An Interpretative Phenomenological Analysis (IPA) Study. Journal of Health Psychology, 20(1), 27-36. Jarman, M., Smith, J.A., & Walsh, S. (1997). The psychological battle for control: A qualitative study of health‐care professionals' understandings of the treatment of anorexia nervosa. Journal of Community & Applied Social Psychology, 7(2), 137-152. Karadağ, F., Ögel, K., & Tezcan, E. (2008). Motivasyonel görüşme: İnsanları değişime hazırlama. Ankara: Hekimler Yayın Birliği. Koch, T. (1995). Interpretive approaches in nursing research: The influence of Husserl and Heidegger. Journal of advanced nursing, 21(5), 827-836. Küey, A.G. (2013). 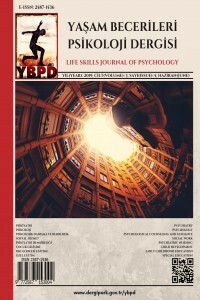 Psikanalitik kuram ve yeme bozuklukları içinde (B. Yücel, A. Akdemir, A.G. Küey, F. Maner, E. Vardar Ed.) Yeme bozuklukları ve obezite tanı ve tedavi kitabı (1.Baskı) (s.59-68). Türk Psikiyatri Derneği Yayınları. Laberg, S., Törnkvist, Å., & Andersson, G. (2001). Experiences of patients in cognitive behavioural group therapy: A qualitative study of eating disorders Scandinavian Journal of Behavioral Therapy, 30(4), 161-178. Levine, M.P. (2012). Loneliness and eating disorders. Journal of Psychology, 146(1-2), 243-257. Lincoln, Y.S. &Guba, E.G. (1985). Naturalistic Inquiry. Newbury Park, CA: SAGE Publications Inc.
Linehan, M. (1993). Cognitive-behavioral treatment of borderline personality disorder. New York: Guilford Press. Maner, F. (2001). Yeme bozuklukları. Psikiyatri Dünyası, 5, 130-139. Marsden, P., Karagianni, E., & Morgan, F. (2007). Spirituality and clinical care in eating disorders: A qualitative study. International Journal of Eating Disorder, 40(1), 7-12. Miles, M.B., & Huberman, A.M. (2016). Genişletilmiş bir kaynak kitap: Nitel veri analizi. S. Akbaba-Altun, A. Ersoy, (Çev), Ankara: Pegem Akademi. Nordbø, R.H., Espeset, E.M., Gulliksen, K.S., Skårderud, F., & Holte, A. (2006). The meaning of self‐starvation: Qualitative study of patients' perception of anorexia nervosa. International Journal of Eating Disorder, 39(7), 556-564. Perkins, S., Winn, S., Murray, J., Murphy, R., & Schmidt, U. (2004). A qualitative study of the experience of caring for a person with bulimia nervosa. Part 1: The emotional impact of caring. International Journal of Eating Disorder, 36(3), 256-268. Pettersen, G., Thune‐Larsen, K.B., Wynn, R., & Rosenvinge, J.H. (2013). Eating disorders: Challenges in the later phases of the recovery process: A qualitative study of patients’ experiences. Scandinavian Journal of Caring Sciences, 27(1), 92-98. Proulx, K. (2007). Experiences of women with bulimia nervosa in a mindfulness-based eating disorder treatment group. Eating Disorders, 16(1), 52-72. Reid, M., Burr, J., Williams, S., & Hammersley, R. (2008). Eating disorders patients' views on their disorders and on an outpatient service: A qualitative study. Journal of Health Psychology, 13(7), 956-960. Rodgers, R.F., Lowy, A.S., Halperin, D.M., & Franko, D.L. (2016). A meta‐analysis examining the influence of pro‐eating disorder websites on body image and eating pathology. European Eating Disorders Review, 24(1), 3-8. Safer, D.L. & Jo, B. (2010). Outcome from a randomized controlled trial of group therapy for binge eating disorder: Comparing dialectical behavior therapy adapted for binge eating to an active comparison group therapy. Behaviour Therapy, 41(1), 106-120. Salbach-Andrae, H., Bohnekamp, I., Pfeiffer, E., Lehmkuhl, U., & Miller, A.L. (2008). Dialectical behavior therapy of anorexia and bulimia nervosa among adolescents: A case series. Cognitive and Behavioral Practice, 15(4), 415-425. Smolak, L. & Levine, M.P. (Eds.) (2015). The Wiley handbook of eating disorders. John Wiley & Sons. Smith, J.A., Osborn, M. (2003). Interpretive phenomenological analysis (J. A. Smith, Ed.). In Qualitative psychology: A practical guide to research methods Thousand Oaks: SAGE, p.51-80. Telch, C.F., Agras, W.S., & Linehan, M.M. (2000). Group dialectical behavior therapy for binge-eating disorder: A preliminary, uncontrolled trial. Behavior Therapy, 31(3), 569-582. Tierney, S. (2008). The individual within a condition: A qualitative study of young people's reflections on being treated for anorexia nervosa. Journal of the American Psychiatric Nurses Association, 13(6), 368-375. Waller, G., Babbs, M., Milligan, R., Meyer, C., Ohanian, V., & Leung, N. (2003). Anger and core beliefs in the eating disorders. International Journal of Eating Disorders, 34(1), 118-124. Wanlass, J., Kelly Moreno, J., & Thomson, H.M. (2005). Group therapy for eating disorders: A retrospective case study. The Journal for Specialists in Group Work, 30(1), 47-66. Whitney, J., Murray, J., Gavan, K., Todd, G., Whitaker, W., & Treasure, J. (2005). Experience of caring for someone with anorexia nervosa: Qualitative study. British Journal of Psychiatry, 187(5), 444-449. Willig, C., & Rogers, W. S. (2013). The SAGE handbook of qualitative research in psychology. Thousand Oaks, CA: SAGE. Winn, S., Perkins, S., Murray, J., Murphy, R., & Schmidt, U. (2004). A qualitative study of the experience of caring for a person with bulimia nervosa. Part 2: Carers' needs and experiences of services and other support. International Journal of Eating Disorder , 36(3), 269-279. Yalom, I.D. (1995). The theory and practice of group psychotherapy. Basic Books. Yellowlees, P. (1988). Group psychotherapy in anorexia nervosa. International Journal of Eating Disorders, 7(5), 649-655. Yücel, B. (2009). Estetik bir kaygıdan hastalığa uzanan yol: Yeme bozuklukları. Klinik Gelişim, 20, 39-44. Zerbe, K.J. (2001). The crucial role of psychodynamic understanding in the treatment of eating disorders. Psychiatric Clinics of North America, 24(2), 305-313.